The EggFest 2018 Cooking demos througout the day! Jackson’s Home and Garden is proud to host our 1st Annual EGGFEST 2018. Bring your family, friends, and pets for a great day of Grilling in Big D. Join us as competitive “EGGHEADS” (Egg Enthusiasts) from around the metroplex show off their unique grilling skills, recipes, and techniques for a Smoking hot Eggsperience. Come watch, learn and taste delicious samples and recipes from breakfast, lunch, and dessert all made on the incredible BIG GREEN EGG. This is an all age event with activities for everyone, including face painting, balloon artist, music, food, shopping, raffles and a lot of fun. Jacksons Home & Garden looks forward to your presence as together we make this event a success! All participants will provide their own food. Big Green Egg, Jacksons Home & Garden. General Admission to EGGperience this great day of Grilling and taste all the delicious samples is only $5.00 per person*. All ages are welcome. Children 10 years and under are FREE. Tickets will be sold at the Entry Gate on the day of the event. This Event is scheduled from 10:00AM - 5:00PM. Grillers will start closing their booths at 3:00 PM to participate in the award ceremony as Jacksons Home & Garden presents the 2018 EggFest winners. For additional questions or concerns, contact our event coordinators at (214)350-9200. All our Cooking Teams will work on a brand new Large Big Green Egg. Eggs are Limited and you can score a “used-only-once” Big Green Egg, the Eggs will be sold on a first come first served basis for $799 each, this great deal included Large Big Green Egg, Nest and Conveggtor!! 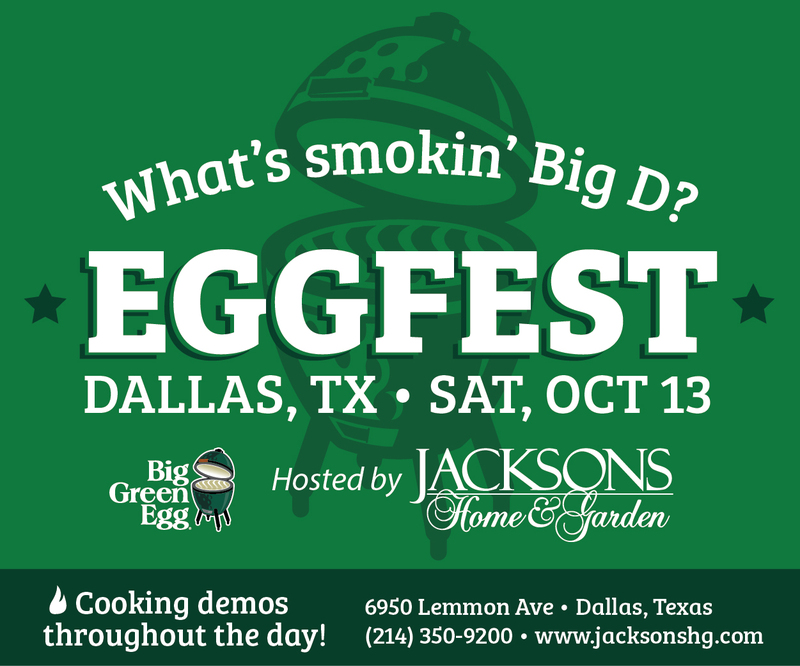 Come Show off your Grilling Skills and be a part of our 1st annual EGGFEST 2018 for a chance to win great gifts, prizes and recognition in Big D.
All participants will provide their own food, cooking utensils and any spices needed to create their masterpiece. Jacksons Home & Garden will provide each participant with a tent, table and chair to get you set up. Prizes awarded for 1st, 2nd, and 3rd place winners. Good Luck to all participants.